I always love myself a good lion dance performance, always making sure to catch one whenever I chanced unto one, be it a hotels, the company, or at shopping malls. 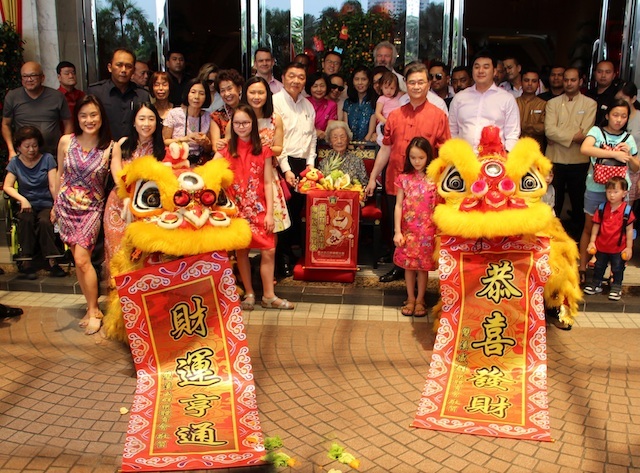 In conjunction with the ‘paws-perity’ year, guests and associates of One World Hotel witnessed a spectacular lion dance performance by Khuan Loke Dragon and Lion Dance Association troupe the other day. Here's a short post on this. Guests were kept amused as two lions, comprising purple and gold showed off their awe-inspiring acrobatic stunts, accompanied by the thunderous beat of gongs, drums and clashing cymbals which in Chinese belief meant to represent good luck as well as to bring in the good ‘chi’, or positive energy flowing into the Hotel. In keeping with the hotel’s annual tradition, the charming lions pranced and danced as they made their ritual blessings way around the hotel’s administration offices, restaurants, function rooms and the reception area in the lobby prior to the highlight of the agenda, the finale performance. The performance concluded with the presentation of ‘platter of prosperity’ consisting mandarin oranges, raw bananas, pineapple, pomelo and green lettuce as a symbol of fortune, luck and ‘all things good’ for the Hotel to the family’s matriarch, YBhg Puan Sri To’ Puan Cheng Gek Hong together with the directors, YBhg Tan Sri Dato’ (Ir.) Teo Chiang Hong, YBhg Tan Sri Teo Chiang Kok and YBhg Tan Sri Dato’ (Dr) Teo Chiang Liang. Also present to witness the event were Mr Chris Niuh, General Manager, joined by fellow Head of Departments of the hotel as well as hotel guests.